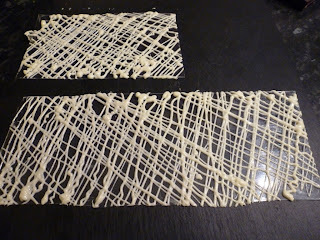 There's a slight change of tack in today's blog in that I've not so much been using a new recipe as learning techniques to enhance an old favourite. 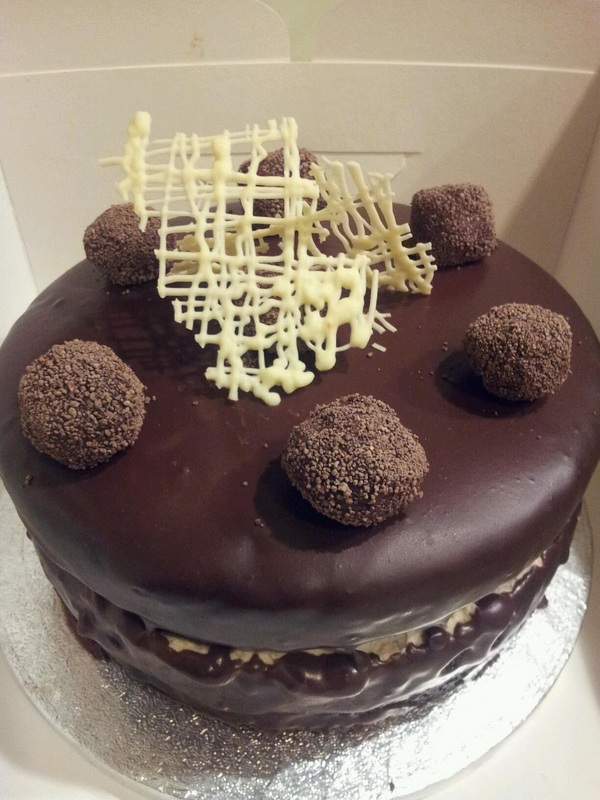 So firstly, I'll share the recipe which is Angela Nilsen's Ultimate Chocolate Cake. I've made this several times and it always goes down a treat - the fantastic @robbiekeys is a huge fan of it. In fact, I find it tastes better when it's a day old than on the actual day of baking. A few weeks back, I was baking a cake for my oldest friend's baby shower. I blogged that day about the disaster which was an 'easy vanilla cake' and ended up making the chocolate cake as a replacement. She then text me to say she'd been laid low with pelvic problems so the surprise party couldn't go ahead without the guest of honour. The uniced cake was consigned to the freezer. I was chatting to the lovely @nellyscupcakes and @janbagnall on Twitter yesterday about cake freezing. I'm no expert, but I regularly freeze my chocolate and vanilla cupcakes as I like to serve the clients at our photo studio (@lccphotography) with the odd treat or too. But trying to juggle that around a full time job and motherhood, it's often easier to do a big bake at the weekend and then defrost and ice the cakes the night before they're needed. If I'm making individual items, I'll always try and freeze a couple of uniced ones just to see what they're like when they're thawed. I've frozen chocolate loaf cakes in the past, but this is the first time for freezing a large celebration cake so fingers crossed it will still taste good when it's defrosted. Anyhow, I'm in the middle of defrosting and decorating it for tomorrow and I'm sure you're wondering where the tips are going to come from. Well the first one is an @Dan_Lepard special. In the summer, I had a nightmare trying to split a very soft, lemon cake into three layers for aforementioned friend's wedding. Reading through "Short and Sweet", Dan suggests splitting layer cakes when they're frozen or at least popping them in the freezer for an hour or so to start them solidifying as it makes them easier to cut and they leave less crumbs behind. Technique tested on this cake and it worked a treat. The next is also a Dan Lepard special. Normally when I ice this cake, I just pour the ganache over the top and let it artfully drip down the sides with the odd pool or too accumulating on the serving plate. But I've always wondered how the pros get such neat edges. Apparently by placing strips of parchment around the edge of the base of the cake. 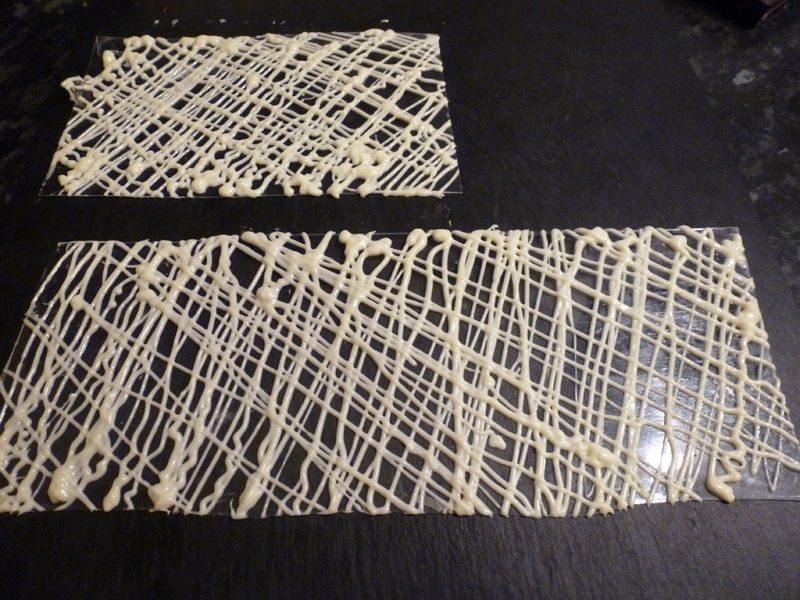 The icing falls on to these, then when it's set, you just trim round with a knife, slide the paper out and "Voila! ", neat edges! As I write, the icing is setting so fingers crossed that will work. The final technique for tonight comes from "Working with Chocolate" by Mark Tilling for Squires Kitchen. I've known @MarkTilling76 for many, many years and was delighted to receive a signed copy of this book last Christmas. It's taken me this long to be brave enough to try something out. One of the simplest decoration techniques is to create a chocolate lattice, which can then be broken into artful pieces and popped on the top or sides of a cake. The technique sounds quite simple, but working with chocolate is a whole new ball game. If you don't have a steady hand like I don't, it will take a while to get used to the different sensation of piping with chocolate compared to piping with icing which is why I've ended up with lots of squiggly lines rather than Mark's neat, straight ones in his example. But they look arty. I'm just praying that when they're set, they peel off of the acetate (or in my case, reclaimed candle box that was cleaned within an inch of its life) without breaking too much so I can artfully add them to the top of the cake when the icing has set. Because Mark is an old friend, I really think that if you want to find out more, you should a) buy his book and b) follow him on Twitter. The lovely @MariaKelly17 has been on one of his courses and has been enthusing about it ever since. I'm very jealous as I'd love to go on one of the courses too. Hint, hint Santa. 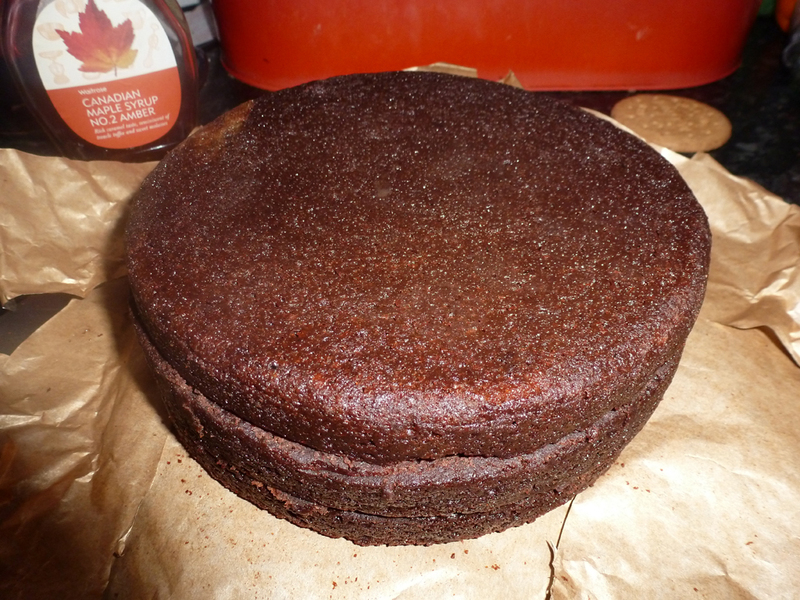 Anyway, will update tomorrow night with pics of the finished cake and notes on how it tastes after being defrosted. While you're at it, if you're on Twitter and you love to bake, follow all the tweeps I've mentioned tonight. They're fab. Well the cake was a resounding success. My only disappointment was that because the original recipe instructs you to just pour the ganache on top and let it run down the sides, the ganache was quite thin and so it bypassed the cream layer, leaving it with an unsightly tidemark around the middle. If I made it with a cream layeragain, I'd use a different ganache that I could liberally spread across the sides, but this one was just too thin. Or, I'd put the ganache in the fridge for an hour first until it firmed up more. With some ganache left over, I made some handmade truffles to decorate and the chocolate trellis worked a treat although I think that using acetate rather than an old perspex box would've made it easier to liberate! Everyone who had a slice sang its praises. Definitely one I'd recommend to everyone!